View from the Devil's Tongue Battery of Gibraltar. 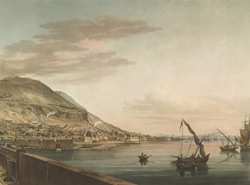 It shows part of the town, surrounded by thick stone walls, and in the distance a number of ships are docked. This view was taken after the Great Siege of Gibraltar by the Spanish which lasted from 1779 to 1783. Since capturing Gibraltar in 1704, the British had sought to improve the fortifications here, and during the siege they had proved successful against heavy bombardment by the Spanish.